"I came away from the DVD & text with the feeling that he was truly a great magician and an honest, hard working, innovative gentleman. My favorite performing magician by far was Dante. I saw him many times and he was exceptional. I get the feeling from your production that I would have thought the same about Thurston if I had seen him. An excellent documentary." "...tremendous and must have been a labor of love." "Everyone who considers themselves a magician should see this DVD. Howard Thurston was my idol and this DVD brings back memories that I treasure." 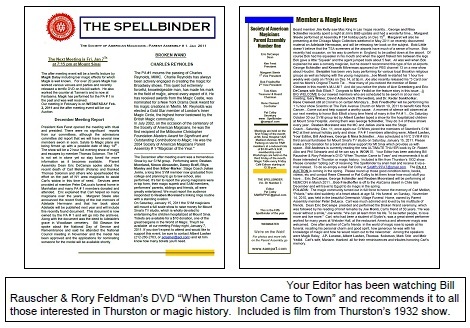 "Your Editor has been watching Bill Rauscher & Rory Feldman's DVD "When Thurston Came To Town" and and recommends it to all those interested in Thurston or magic history. Included is film from Thurston's 1932 show." "I greatly enjoyed the Thurston DVD." "The DVD is just great! It is fantastic and something to treasure. I loved it. The whole thing was great and wonderful. I especially enjoyed the rare footage of Thurston performing for the crippled children at Bellevue Hospital and Jane Thurston singing 'My Daddy Is A Hocus Pocus Man.' It was dynamite!" "The new DVD "When Thurston Came to Town" has now been released by noted Thurston collector Rory Feldman. This DVD is a broadened and visually enhanced version of William V. Rauscher's magic lecture of the same name, which he presented during a Magic Collectors' Association weekend back in the 1990s. Feldman has certainly put his heart and soul into this project. What you get is Bill's wonderful lecture supported by never-before-seen photos of Thurston and his memorabilia, every known archival film footage of Thurston including some never-before-seen, interviews with leading collectors and magicians who either saw Thurston or were influenced by him, recordings of Thurston's voice, his daughter Jane singing, "My Daddy is a Hocus Pocus Man," and much, much more. With Jim Steinmeyer's forthcoming book on Thurston, the timing on this DVD couldn't be better. It is not available through magic dealers but through Rory Feldman. Rory's website is: www.thurstonmastermagician.com. Bill and Rory are to be congratulated for this effort to elevate Thurston back on to the pedestal as America's favorite magician, a position he so justly deserves." The above message from Tom Ewing was taken from "Alan Watson's Magic New Zealand - Issue Number: #756"
Click here to see Tom Ewing's comment poster on The Genii Forum. "Congratulations on a job well done. Thurston was truly an amazing person." "You have produced a master piece in your DVD...When Thurston Came To Town. It is a great piece of magic history, very well documented. I thought I knew a lot about Thurston however I was pleased to learn even more from your DVD. You and your host, Bill Rauscher, are to be commended for the time and effort you both put into the making of this one-of-a-kind DVD. Anyone who enjoys the history of magic and magicians should have a copy in their collection. By the way, the packaging of your DVD is terrific, the best I have ever seen." "I did purchase "When Thurston Came to Town" and love it. I purchased two as I have a friend that is 81 years old; who is a big fan of Thurston and had never seen any moving pictures of his performances. Thank you for putting this together, he loved it and am glad he had an opportunity to see Thurston while still with us. I thought you should know that the production truly made an 81 year old mans year!!!" 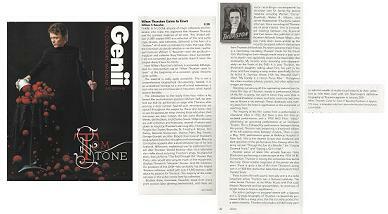 "A wonderful contribution to the history of magic and Thurston. They [the DVD's] are wonderfully done." "I have just spent a memorable evening with Howard Thurston...'When Thurston Came To Town' the DVD, is a GREAT contribution to our ART. Every magic aficionado must see it." "Over the past decade, Feldman has continued to add to his collection, amassing what is undoubtedly the world's foremost archive of material -- covering the life of Thurston. Three years ago, Feldman approached Rauscher about creating a video version of When Thurston Came To Town. The result is this nearly three-hour DVD set that places Thurston squarely back on his pedestal as the greatest American magician of his time." "Still, for the die-hard Thurston fan, or one who wants to know just about everything about him, this DVD set contains many rare treats -- among them Thurston's voice, not once, but several times. And then there's marvelous footage of Thurston in action, showing the scope of his mammoth show. Particularly fascinating is film of an outdoor appearance at Bellevue Hospital in the 1920s, when Thurston brought practically his whole illusion show to the patients." Seeing his handling of the Dove Catching net is a lesson in how the trick is supposed to be done, and it shows that Thurston was indeed as good a performer as we've been told." "The closing moments of the DVD, when Jane Thurston (in her eighties) sings the original song "My Daddy Is A Hocus Pocus Man," are a fitting finale that humanize the whole story." "The production values of the DVD are very good. The tri-fold slipcase includes a 32-page color booklet with a previously unreleased press biography of Thurston. In all, it's a beautiful package." 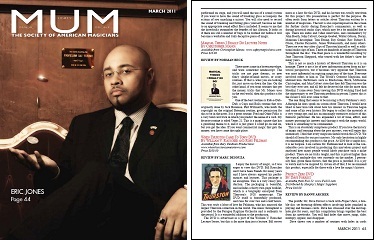 "...those who buy it will find new appreciation for Howard Thurston and his place in American magic." "A 'must have' item for historians and enthusiasts." "If you get the opportunity to purchase Rory's DVD on Thurston that he worked with Bill Rauscher on, I recommend it. It's very nicely done." -- "Buy the DVD. It's worth it." "It's really wonderful. Excellent work! The audio message from Thurston seeming to talk to his friend from heaven was fantastic. He really had superb voice. Never knew this existed." "I enjoy the history of magic, so I was eager to view this DVD. Bill Rauscher and I have been friends for many years and I have always enjoyed his performances and lectures. This package is no exception. This is a very classy production. The packaging is beautiful, and includes a thirty-two-page booklet, which is a biography excerpted from Thurston’s 1928 manuscript. The DVD itself is beautifully produced, and runs for over two and a half hours. This was truly a labor of love for Feldman, who has amassed the largest Thurston collection in the world. The music throughout is provided by the Paragon Ragtime Orchestra and is authentic to the period. It is a wonderful addition to the production. The DVD is advertised as a part of the William V. Rauscher Lecture Series, but this is far more than just a lecture. Bill serves more as a host for this DVD, and his lecture was totally rewritten for this project. His presentation is perfect for the purpose. He often reads from letters or articles about Thurston written by a number of magicians. The text is also superimposed on the screen for further clarity during Rauscher’s commentary, as well as during historical audio clips, which may be a bit muddled due to age. There are audio and video interviews, and commentary by John Booth, John Calvert, George Goebel, Walter Gibson, Dorny, Maureen Christopher, Tom Ewing, Ray Goulet, Rev. Robert E. Olson, Charles Reynolds, James Wobensmith, and many others. There are over ten video clips of Thurston himself as well as additional audio clips of him. There are hundreds of images of Thurston throughout the disc. The final piece is a wonderful recording by Jane Thurston Sheppard, who toured with her father’s show for many years. This is not so much a history of Howard Thurston as it is an homage. There is not a lot of new information given from an historical perspective, but it becomes very apparent that Thurston was most influential on aspiring magicians of the time. Everyone involved refers to him as The World’s Greatest Magician, and idolized him. Performers such as Blackstone, Birch, Milbourne Christopher, and John Calvert state that they felt Thurston was the best they ever saw, and all felt he deserved the title far more than Houdini. I came away from viewing this DVD wishing I had had the opportunity to see Thurston perform in person. I guess this is the closest I will ever come to that. The one thing that seems to be missing is Rory Feldman’s story. Although he does speak on screen about Thurston, I would have liked to hear him talk about how his interest in Thurston began and some of his own history. He began to collect the materials at a very young age, and has an amazingly extensive archive of this fantastic performer. He has expended a lot of time, effort, and money pursuing his interest and sharing it with the magic world, which is something to be commended. This is an absolutely sumptuous product. If you love the history of magic and learning about the past masters, you will enjoy this immensely. I feel that every magician should watch this DVD. We should all learn for our past masters. My only hesitation in highly recommending this product is the price. At $100 for a single disc, it is no bargain. I am certain Mr. Feldman had to look at the considerable costs involved in producing this marvelous project and analyzed how many people would likely purchase such a niche product. There are no tricks taught, and this is priced higher than the typical multiple-disc sets currently on the market. I personally feel, given these factors, that the price is justified. It is a joy to watch and to be inspired by. Given all of that, I do recommend this product, especially for those with a love for magic’s history." "The work you put into this production is impressive. Your Thurston collection, Rory, is the best and most comprehensive there is. But in particular we are grateful for your gathering, documenting and putting into video the statements of all those who had the opportunity to see and meet Thurston. The stories from people like John Calvert, Larry Weeks, and even the Dorny recordings gave us a glimpse of the magician. It was a particular treat to hear William Self telling us the story of how he won the magic contest and performed on stage with him. Your efforts will preserve the Thurston legacy long after all the witnesses are gone. THANK YOU again for such a contribution to magic history! May there be more installments by Rory Feldman Productions, and may there be more narratives and research by you, Bill! (BTW, your diction is impeccable!)" "A visual and audio treat awaits the purchaser of this DVD that was created to honor the greatest magician who ever lived; Howard Thurston!" "I spent a very enjoyable afternoon yesterday watching 'When Thurston Came To Town.' Now, I know what you are thinking, I should have been out playing tennis or running a marathon but no, I was lounging on my sofa watching, with great joy, the story of the world's greatest magician (the title really fit him like a glove). Like so many others, I regret not having seen the Thurston show. I guess it was about 1932 (I was 12) when I listened to the Thurston radio program and sent away for his magic booklet. I remember his sponsor was the Swift meat packing company. I don't know what happened to the booklet but I still have a mental picture of the orange cover with a drawing of the master. You did a great service to the magic community with this DVD. It will be viewed and enjoyed by magicians for decades. I can certainly appreciate the time and effort you put into it." "Thurston deserves every minute on this comprehensive DVD. He was the man people said he was and more." "Last night at 11:00p, I decided to take a look at your Thurston DVD. I was going to spend a few minutes and then watch it later. THE TEXT, THE VIDEO MOVING PICTURES, THE STILL PHOTOS FROM MANY YEARS AGO, AND BILL RAUSCHER'S VOICE AND APPEARANCE WERE ALL SO UNBELIEVABLY AMAZING THAT I COULD NOT TAKE MY EYES AWAY FROM THE SCREEN!!! I WAS GLUED TO EVERY SINGLE FRAME UNTIL 2:00a THIS MORNING. CONGRATULATIONS ON A SUPERB, SUPERIOR, SUPER SUPER SUPER PRESENTATION! I shall study this treasure and feel the excitement time and time again. This is the REAL MAGIC!!" Harry Blackstone Sr.'s "Elusive Moth"
"A few days ago I received a copy of your DVD: When Thurston Came to Town. Unbelievable! I have watched and listened. It was like being transported into another dimension. You forget everything around you while you penetrate the soul and artistic life of this Maestro. I enjoyed every second of it, and I will treasure it. Also, I like the compendium booklet; the written biography you did. In my library I have 8-10 books of the Master, but I never enjoyed so much the "visual" life of Thurston as I did with your DVD. Please give my compliments to Rory Feldman for the beautiful cover, and all the work of graphic prints." "This amazing DVD is a rich panorama of Howard Thurston's fabulous career and a celebration of the Golden Age of Magic. Never before have so many rare and one-of-a-kind photographs, movies, and voice recordings of a great figure in magic made available. For two and a half hours, hundreds of rare images of Howard Thurston appear on the screen, one after another, as the host of the program, noted magic historian Bill Rauscher, leads the viewer through the exciting days "When Thurston Came To Town." More than three years in preparation, this elaborately produced video combines the recollections of those who knew Thurston or saw him perform with a virtual tour of Rory Feldman's incredible collection of Howard Thurston memorabilia. 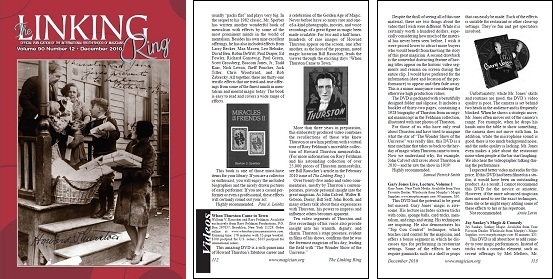 (For more information on Rory Feldman and his astounding collection of over 25,000 pieces of Thurston memorabilia, see Bill Rauscher's article in the February 2010 issue of The Linking Ring.) Over twenty five audio and video commentaries, mostly by Thurston's contemporaries, provide personal insight into the great magician. As John Calvert, Walter B. Gibson, Dorny, Bill Self, John Booth, and many others talk about their experiences with Thurston, his power to impress and influence others becomes apparent. Ten video segments of Thurston and five recordings of his voice also provide insight into his warmth, dignity, and charm. Thurston's stage presence, evident in films of his shows, confirms that he was the foremost magician of his day, leading the field with "The Wonder Show of the Universe." -- certainly worth a hundred dollars -- high production values -- The DVD is package with a beautifully designed folder and slipcase. It includes a booklet of thirty-two pages, containing a 1928 biography of Thurston from an original manuscript in the Feldman collection, illustrated with rare photos of Thurston. For those of us who have only read about Thurston and have tried to imagine what the star of "The Wonder Show of the Universe" was really like, this DVD is a time machine back to the hey-day of magic when Thurston came to town. Now we understand why, for example, John Calvert still raves about Thurston in 2010 -- and he saw the show in 1919! Highly recommended." "Congratulations to you and Bill on a very pretty, informative, and well-produced collection of important material. You did a great job." Author of "The Last Greatest Magician In The World"
"I just finished viewing your Thurston DVD I only have one word to describe this most comprehensive collection on Thurston, MAGNIFICENT!!! I now know more about Thurston than I know about myself. Great job on this wonderful reference for the beginner or professional entertainer. As they say, the more you know about history the more you'll understand the workings about almost anything or anyone. Once again, congrats and wonderful job!" "There were magicians and then there was Thurston. Thanks to Mr. Feldman, this artist finally gets the attention he deserves. This DVD is required viewing for everyone with a true love of the theatre."